William Koch, CEO of energy and industrial products giant Oxbow Carbon LLC, expressed pessimism about the future of coal in the United States during an interview last week. While not as active in politics as siblings David and Charles Koch, Bill Koch has also donated millions to political candidates, including a large political action committee backing former Republican presidential candidate Mitt Romney. "The coal business in the United States has kind of died," Koch said during a phone interview Friday, "so we're out of the coal business now." 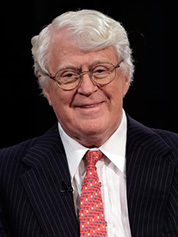 Koch added, "Generally, people and businesses try to do the thing that's most economical. A lot of the profit has gone out of the coal business." Koch's sentiments were in line with recent coal industry woes. Low natural gas prices have pushed many utilities to switch away from the black rock, and new and potential environmental regulations are also factoring negatively into company bottom lines. Koch said the main reason for the drop in U.S. coal use has been that "so much natural gas has been discovered from the shale drilling. That gas is very, very cheap now, and so electricity from gas is cheaper than electricity from coal." And while Koch doesn't blame President Obama for all the fuel's troubles, he's not fond of the president's actions, either. "What Obama's trying to do is drive more nails into the coffin," Koch said. Coal is far from dead, the fuel's boosters insist. They turn to statistics from forecasters like the U.S. Energy Information Administration, which last year said coal would provide about 32 percent of the nation's electricity in 2040. Oxbow Carbon does have coal and natural gas interests, but today it is primarily a petroleum coke distributor. Petroleum coke, a carbon-rich residue from oil refining, can be burned as a substitute for coal by some electric utilities. Oxbow Mining, one of Oxbow Carbon's subsidiaries, announced late last year that its Elk Creek Mine in Somerset, Colo., would temporarily idle production and lay off 115 workers. "Unfortunately, we had to close our mine down because we had a gas explosion in it," Koch said. "Fortunately, no one got hurt, but if we went back in, it could have killed people, so we're saying, 'All right, we're going to close it.'" Elk Creek used to be one of the largest underground coal mines in the country, producing more than 6 million tons of coal each year at its peak. Koch's comments on coal were made during a conversation focused primarily on Cape Wind, a proposed wind farm in Nantucket Sound that he opposes. Koch's older brothers, the heads of Koch Industries Inc., are the more well-known figures in the family, often held up as symbols of the fossil fuel industry's opposition to Obama's clean energy agenda. Oxbow gave at least $2.75 million to the Restore Our Future PAC in support of GOP candidate and fellow Cape Wind dissident Romney during the 2012 presidential campaign (Greenwire, Aug. 14, 2012). Koch himself contributed at least $250,000 to the PAC. In the past, Oxbow employees have publicly stated that the Obama administration's environmental regulations are too stringent. During Friday's interview, Koch also took aim at stronger oversight by the Mine Safety and Health Administration. "The mine health and safety regulations have gotten so great, that's driven up the cost of mining coal tremendously," Koch said, echoing a common view among coal executives. "I'm not saying that there shouldn't be those kinds of regulations, because I don't believe in killing people in your coal mine." But Koch, like other MSHA critics, said the agency's enforcement can be counterproductive. MSHA has in the past defended its regulatory efforts and touted declining violations and increasing safety compliance. "We had a citation at one of our coal mines where we had 50 toilets and one of them was plugged. And we had like a $5,000 fine for that," he said. "So some of the regulations have just gotten over the top. You know, the pendulum swings from too little regulation, now it's too much. Hopefully, it will find a happy medium somewhere." Correction: An earlier version incorrectly listed the amount of money Oxbow gave to the Restore Our Future PAC in the 2012 elections.